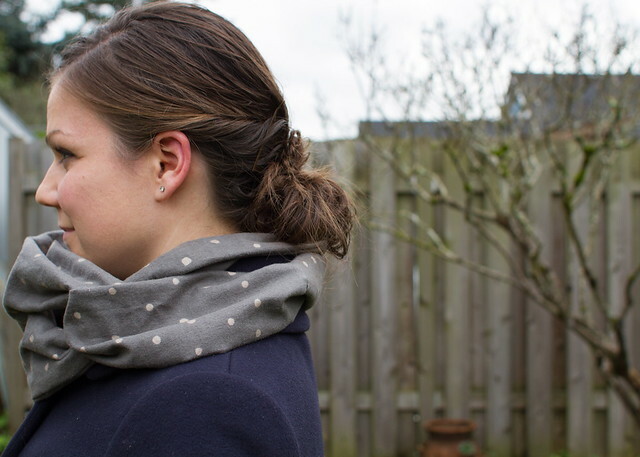 commuter cowl review and giveaway! i’m the next stop in A Very Go To Christmas blog tour! Andrea is building a pretty great shop over there at Go To Patterns, and it keeps getting better the more designers she brings on! you should definitely go check it out, and check back often because i think the first time i ever looked she had, like, 3 patterns in there and she’s now up to nearly 70! lots of basics, lots of fun stuff, lots of options. 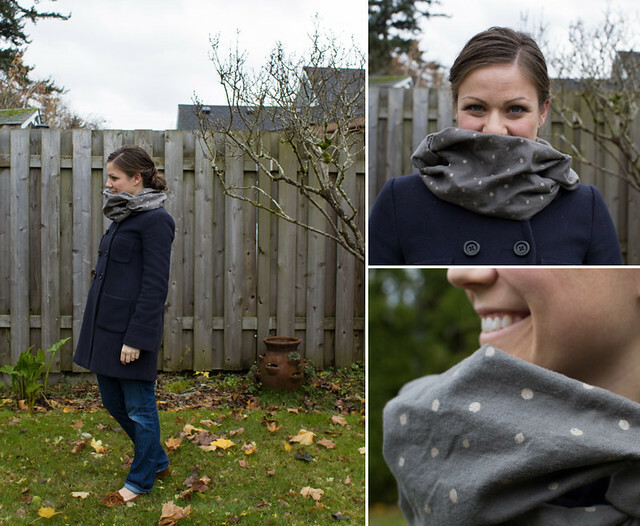 the pattern from the shop that i chose to review is the commuter cowl, designed by shannon of luvinthemommyhood! i remember loving this pattern when it first came out but never pulled the trigger and got it. i was excited to sew it now, especially after making her sweetheart dress and having such a good time with it. every time i saw this cowl pop up, i tried to figure out how it was made. it SEEMED super simple, but i still had no idea what was going on with the split and the twist and for the life of me couldn’t figure out how to make it myself. a pattern was needed. even with the pattern, for some reason my brain was having trouble grasping a few basic concepts. do you have certain techniques like that, things that just trip you up no matter how well-explained they are? for me it seems to be tubes. i always sew the wrong thing closed, think something will turn right side out that won’t, all sorts of craziness. i kept having to tell myself to just follow what the pattern said and not think i knew better…especially with finishing the scarf off…and it all worked out great! i want to make another now that it finally clicked (which i should because i really love the final product and this one is destined for Christmasgiftland). the pattern lists instructions for varying sizes of cowl depending on the fullness you want and the type of fabric you’re using. i made the 1/2 yard option with this amazing Nani Iro flannel (WITH SPARKLY POLKA DOTS) that i picked up at bolt during their sale, but it’s gone now. miss matatabi has a nice Nani Iro selection though, including flannel! here’s the thing, too. shannon is a pacific northwesterner. even though she’s in canada and i’m in the US, we share a climate. a gal from a chilly and rainy place understands that scarves are very important to have in a wardrobe. i live in trench/rain/warm coats all fall/winter/spring, and the only chance i really have to add some personality to my outerwear is through my scarf collection. they’re cozy, too. it’s amazing how much warmer you can be when your neck is covered. frankly, i even wear them all day at the office – i can never have too many! 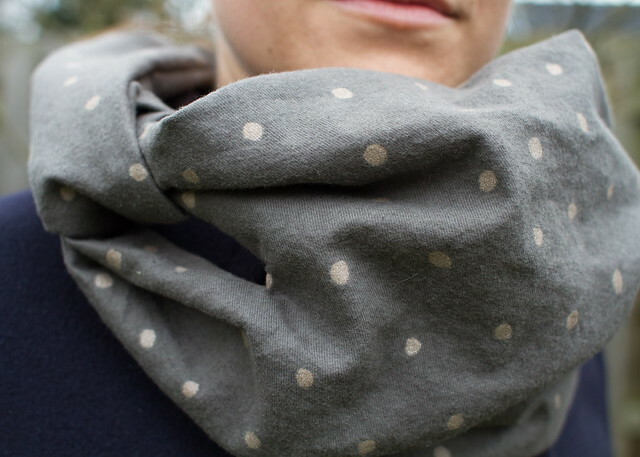 i think gals in warmer climates could rock a commuter cowl in voile or gauze, though, and it’d have a totally different (but gorgeous) look! 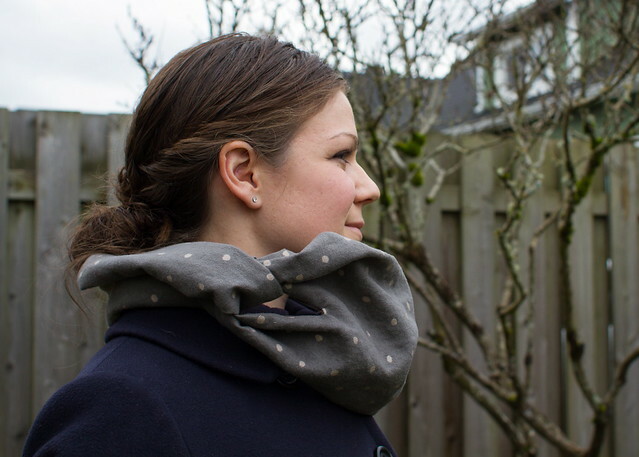 head over to the Go To Patterns shop to pick up your commuter cowl pattern NOW! it’s only $4 and you can definitely get your money’s worth if you give one of these as a gift! then go ahead and make one (or more) for yourself. you know, the old “one for them, two for me” type situaish. oh, and thanks to my good friend erin for taking these photos! apparently i’m a bit more relaxed with a lady photographer? AND NOW…another giveaway! two days in a row, that’s right! 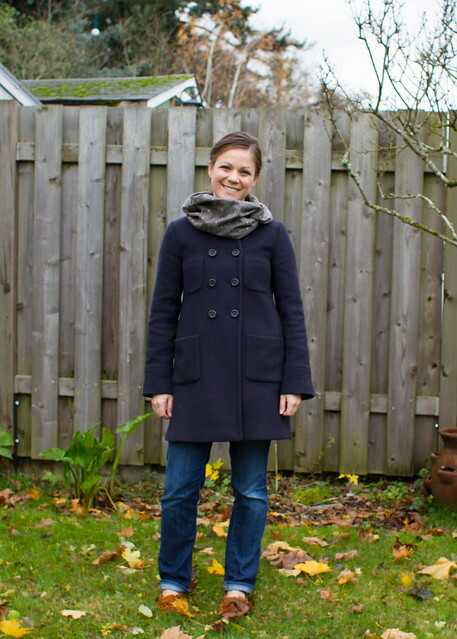 i was provided with the commuter cowl pattern at no cost for this review, and i am also an affiliate of Go To Patterns. my opinions, as always, are my own. Love it! I live upstate NY and a scarf is a necessity in the fall/winter months here as well. Thanks for the give a way! Wow that pattern is awesome! I really love the fabric you chose. Can’t go wrong with metallic polka dots! I love the fabric you chose to make the cowl in. you are so stinking cute!!! love the cowl and that’s the perfect fabric for it!!!!! 🙂 beautiful job. So cute! You’re rockin’ that cowl! I know what you mean, I love my cowls in the winter, though I’ve only made the knitted variety. This looks SO! much faster. Maybe I need this pattern, too! How pretty are you?!?! 🙂 Perfect design to protect against the wind! Love the cowl! I just might have to get the pattern. I wear tons of them in the winter too and knitting them takes a long time! Kristin, you look great in these pics! The whole time I was reading I kept thinking, “Wow, Kristin is really rockin’ these pictures today.” And then you mentioned the part about your friend taking them. I swear, I am SO much more comfortable when someone OTHER than my husband takes my picture. Why?? It’s so weird. Anyway, great review! There may be something wrong with me because I can’t figure out where to click for the giveaway?? Can someone help this sleep-deprived mama figure it out? Thanks, Kristin! Thanks, Caila! Seriously, what it it about husbands taking photos – I get immediately stressed and it’s not even his fault. ANYWAY. You need to click through to Rafflecopter to enter the giveaway; it’s not supported on my site directly. I made the link a little more obvious now. Sorry about that!! I’ve looked at that pattern wondering about the twist as well, I guess I’ll have to buy it some day to find out. I love the fabric you chose, flannel sounds so nice for a cowl. That fabric is gorgeous!! Oh, how I wish I had a Bolt-like store where I live! Your cowl looks fabulous! Having lived in Vancouver for 4 years, I understand your comments about the climate completely! You are so cute! I’ve sewed a few tubes shut thinking I would be able to pull something through – love it when it finally clicks ahead of time, you know, so I can avert the whole seam ripping step. always love a good cowl pattern! the fabric is lovely! I may have to whip up some of these as Christmas gifts! Super cute pics. Your fabric choices are always genius! Adore the cowl, am definitely going to get me that pattern. I can relate to your “trip ups”, it happens to me too – I blame my left handedness!! ha ha. Thanks for the opportunity, again. I love it – that fabric is gorgeous! I have a friend who wears scarves like that all the time. Now I hope I get her for our secret Santa so I have a good excuse to try out that pattern! Great photos and that commuter cowl looks fantastic on you! I was just in Paris where everyone (including the men) were all wearing HUGE scarves. I definitely need to make myself some cute ones to keep my neck warm this winter too. Fingers crossed! Thanks for the chance! Love the fabric you chose! It adds great volume and coziness, it makes the design more desirable for us New Englanders too! And I have a whole list of ladies who would love one!! It turned out really cute! I love the fabric choice. Tubes also totally trip me up, and I lost my train of thought while making my commuter cowl, and totally messed it up. I don’t know why things like that totally turn my brain inside out, but they do! oh you’re so cute and that fabric is so gorgeous! good for you for not letting it sit on your shelf forever!! 🙂 thanks girl! sometimes you just gotta make that first cut! I recently bought this pattern and cranked out loads of them for christmas presents. When i tried mine on i couldn’t get it to lay quite how i liked. i think it came out a bit long for my taste even though i followed the pattern sizing. Next time i think i’ll shorten those tube legs up a bit. That’s fun you made a bunch for Christmas! Sorry about the fit, but yeah it’d be super easy to just shorten the leg tubes (hehe). I think how it lays depends a ton on the fabric choice. One with a lot of body like my flannel here tends to stand up pretty nicely. super cute! It looks light so you could wear it into spring as well! I love the cowl and the fabric you chose to make it in. I want to make one now, too. Nice job! You are so adorable! I too have been eyeing this pattern. I like me a good scarf as well! love the nani iro flannel, am looking forward to winter down here now just so I can sew some up! LOVE the scarf. Also, I’m with Caila- so much better when a friend takes the pics. You are adorable, by the way. SO CUTE. alright, you just convinced me that i neeeed to make this. like tomorrow. just LOVE how yours turned out! Great cowl scarf pattern. I’ve been seeing these around and probably will sew one after christmas – once I finish gift-sewing. Very cute! I love that polka dot fabric!